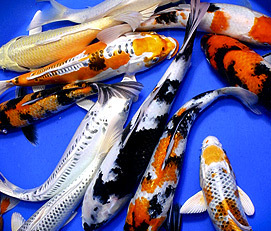 Your customers want high quality Koi and Butterfly Koi, and you need to be able to provide. Every spring and summer, we spend thousands of hours culling our stock down to only the highest quality specimen. This ensures that we can offer Koi and Butterfly Koi that rival Japanese stock in quality, at only a fraction of the price. A few weeks after hatching, young fry around one inch in length are brought into our holding facilities for culling. Many hours are spent meticulously removing and keeping only the koi that show signs of potential. At this young age, there is still a large amount of development left to take place, and many varieties appear nothing like they will at maturity. It takes a well-trained eye to spot the koi with potential, and we have refined our technique over many decades. The keepers are placed back into mud ponds to continue growing. Later in the summer, the ponds are again emptied and all of our koi are brought back to the holding facilities for further culling. By now, most are 3 to 6 inches in length, and their colors and pattern have really begun to show. 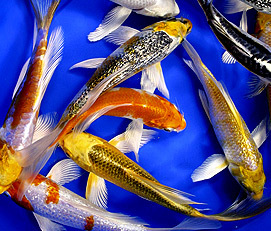 Some koi are removed and become the Standard, Premium, and Premium Select Grade Koi available for sale. Others are selected for further growing and placed back into grow-out ponds to winter over. After more growth and a winter of hibernation, these koi have grown into the 6 to 10 inch range and have begun to really show their true potential. Most are sent into quarantine and will be available for sale later in the year, while a select few of the highest quality will be grown even further, and will eventually become our premium and premium select koi in the 10 to 16 inch range. A very select few may even be saved for potential use as brood stock. This refined and meticulous process of culling ensures that only our highest quality koi are offered for sale. While culling, we judge our koi and butterfly koi on three specific criteria: color, pattern, and body & fin conformation. A wide range of colors and hues will be present in each spawning, from the brown koi that resemble wild carp, to the brightest and most vibrant reds, whites, blacks and other colors. Any koi that show little or no potential for good color are culled, and only the best are kept. Each variety possesses it’s own guidelines for what makes a high quality pattern, and we follow these guidelines closely. Is the pattern balanced evenly on the left and right sides of the body? Do the contrasting colors complement each other and create a sense of symmetry and balance? Does the hi or sumi extend too far down the head, onto the nose? We ask these and many other questions in the process of bringing our best koi to market. Color and pattern do not matter if the fish does not have good body and fin conformation. Is the body shaped correctly, or is it too skinny or fat? Are the gill plates flared? Are all of the fins full and developed, with no deformities? Any koi with major faults or deformities are culled, while koi with minor faults will become our Standard Grade Koi. Higher quality koi with no body and fin faults will become our Premium and Premium Select Grade Koi.